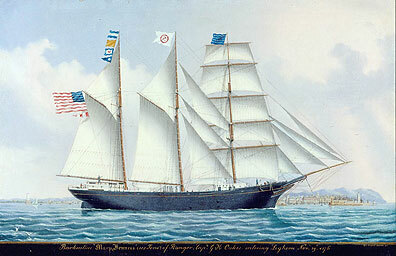 Margaret Oakes, a Brewer, Maine teenager, accompanied her sea captain father, Captain George Oakes, on a voyage in 1880-81. Margaret was 14 when they departed aboard the barkentine Mary Jenness, traveling first to Marseilles, France, where they discharged a cargo of oil and remained in port for about two months. They left France on January 9, 1881, sailing to Havana, Cuba, with a load of tiles, then on to New York with a load of sugar. Margaret’s journal is often about the weather and places they pass, with little detail about food, how she occupied her time, or other people aboard the Mary Jenness. Contrast this to Edwin Mitchell’s journal. Margaret evidently prepared for her trip to France by translating her favorite Maine foods into French—see her list following the journal entries. Margaret makes many references to visiting other captains’ vessels in port. Her description of her stay in Marseilles is full of details about gardens, weddings, museums, cathedrals, shopping, theater, art, and other events. This description is found in our chapter Stories of the Sea: Women’s Roles. When she returned to Maine, Margaret continued her journal for a short time. She created a cookbook with wonderful-sounding desserts, which is interesting for the lack of detail compared to modern cookbooks. For example, there are no temperatures or baking times given—in the days of wood or coal stoves, much was left to the experience of the baker. In addition to her recipes and French translations, Margaret also created other lists: interesting facts and literary “conundrums.” The journal and Margaret’s other writings give us an interesting picture of a young girl growing up in 19th century maritime Maine.